Nine in 10 Aussie teenagers now own a smartphone, while more than half own an Apple iPhone, according to new data by Roy Morgan Research. The research, which was conducted between July 2015 and June 2016, revealed that just over one million teens (91 per cent) aged 14 to 17 years have a mobile phone, and nearly all of those mobiles are smartphones (94 per cent). Furthermore, a massive 75 per cent of teens are already on to their second or subsequent handset. The research also found that 58 per cent of teens own an Apple iPhone (compared to 41 per cent of all Australian mobile owners 14 years and over), and 22 per cent own a Samsung (compared to 31 per cent overall). 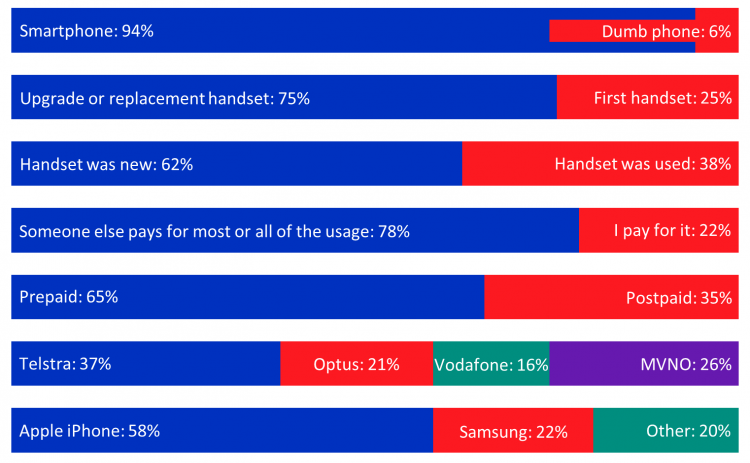 When it comes to mobile service providers, 37 per cent of teen mobile owners are with Telstra (compared to 44 per cent of all mobile owners), 21 per cent are with Optus and 16 per cent are with Vodafone, while 26 per cent are with mobile virtual network operators (MVNOs) such as Virgin (7 per cent) and Amaysim (5 per cent). The average teenager aged 14 to 17 years spends (or their parents spend) around $10 less per month on mobile usage than adult mobile owners, which Roy Morgan said is largely driven by teens’ higher take-up of pre-paid plans with discount MVNO providers. And those 22 per cent of mobile-owning teens who have to pay for usage themselves spend almost $5 less a month on average than those whose parents foot the bill, according to the data. Roy Morgan Research CEO Michele Levine noted that teens aged 14 to 17 are around twice as likely as other mobile owners to use the device for playing music, videos and games, while 82 per cent of teens have done one or more of these activities on their mobile in the last four weeks – almost as many as those who have made an actual phone call with it. “Almost half of teens say they can’t live without a mobile phone,” she said. “They’re also much more likely than other mobile owners to say they’re happy to receive relevant ads on the phone – especially if it could reduce the phone bill.